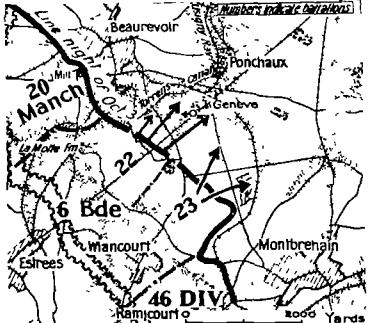 Before the 22nd Battalion began its dawn attack at Beaurevoir, the 20th Manchester’s of the British 7th Brigade had first to secure a number of objectives requiring a wait of 25 minutes on the ‘JOT’ after the barrage had opened at 6.30am, which resulted in the area just to the rear receiving heavy shelling. The fight of the 4th October was much more severe than that of the previous day. The objectives lay about Geneve, just beyond the road leading from the village to Montbrehain and to the right of Ponchaux. After advancing 1,000 yards the first objective was taken without much difficulty but the second was only captured after stiff opposition from machine-guns. It was not without still more costly fighting that the final objective was carried, the task made more difficult by heavy enemy fire from a factory just south of Geneve and the fact that the Manchester’s which had penetrated into Ponchaux were unable to hold the village from which machine-gun and rifle fire were now being received. The 22nd Battalion’s left flank was thus exposed until secured by the left hand company. By 10am the Battalion had completely consolidated all its objectives but at a severe cost having lost twenty-two men killed in action, including 2nd Lieut. Dawsett who had just re-joined from Officer Training Class with his commission, and sixty-five wounded in this the 22nd Battalion’s final fight. A large number of prisoners were taken along with twenty machine-guns. Thirty-two men from the 22nd Battalion were awarded for their bravery and gallantry along with fourteen men from the previous days fighting of 3rd October.